Sooner or later, new students to Classical Tai Chi may reveal their expectations about the learning path. Sooner or later, long time students in Classical Tai Chi who expect that they are on the right learning path may "become careless, neglecting some of the fundamentals in the form playing". This as Master Hwa describes in Forum 10, October 2004 is called "advancement followed by periods of stagnation, and even a turn for the worse." Whether beginner or advanced, our expectations will most often be the deciding factor in whether we are happy or sad over our study. There are interpretations of the I Ching that point out the danger inherent in expectations which are too grandiose. The Tao te Ching advises us not to "fight" over issues that do not meet our expectations. This even applies to our own gumption in maintaining our practice; practicing when we don't feel like practicing for instance. There is no point in "beating ourselves up" because we expected that not only would the Tai Chi be easy, but that it would be correspondingly easy to get up in the morning and even practice. Various writers have described expectations to be a kind of prison. The many styles of what Master Hwa calls "ethereal Tai Chi" seem to encourage unrealistic expectations. Medical investigators compare Tai Chi with conventional aerobic exercise and qualitative analyses explore patient experience, belief systems and expectations. Participants in various studies are asked what their expectations are. Psychologists who do Tai Chi warn against making mountains out of molehills, creating psychological barriers for ourselves in learning Tai Chi, which inevitably have to do with expectations. I notice that students who merely think they are going to be pushed back hard during push hands (not that we ever push anyone hard), react prematurely by exhibiting extreme muscle tension, this is because of expectation. A new student said "I expected more people in this class, aren't there going to be more". People who begin or who have only been involved for a year or so question why they are not teaching or what criteria it takes to be a Master. In other words, they are expecting to receive the "treasure" for their work in Tai Chi. 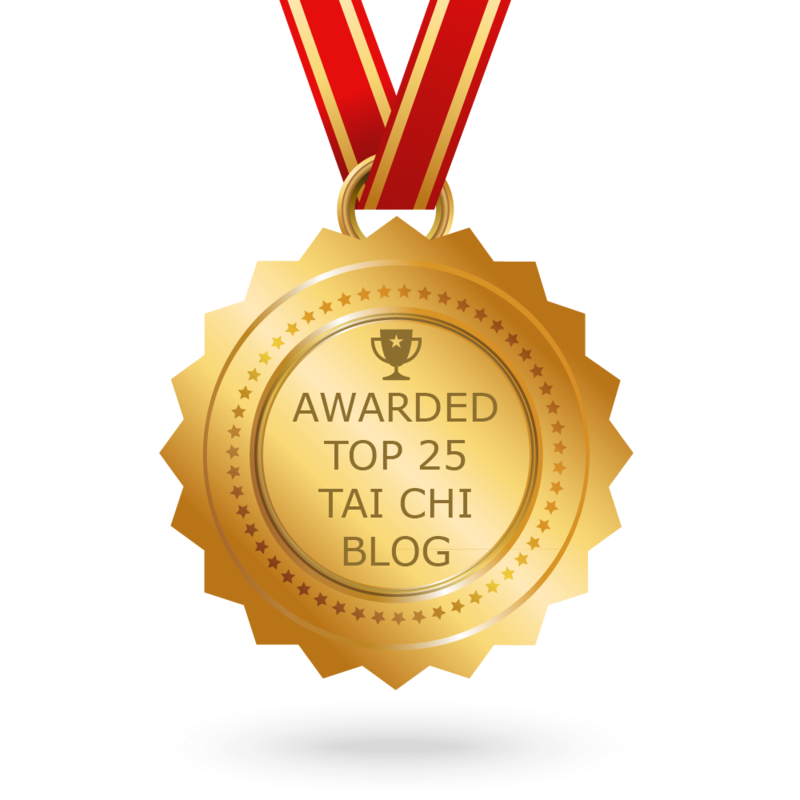 Notice I say "expecting" not "uncovering", there is a difference which as we have established as "expectations" in both attitude about standards of achievement in Tai Chi , even down to finer and finer distinctions. Master Hwa has said: " I am always amazed at the extenal martial arts schools that they can have such fine distinction between different color belts and different color strips on each belt". I have happily discovered (uncovered) that there is both a tempo and a rhythm to Classical Tai Chi. It was only with my venture into "Internal", note the emphasis on "Internal" Discipline that I stopped demanding of both myself and my teachers that there be signposts for my progress. I also find that true understanding of internal means I can have classes of mixed levels because there are truly no tests of achievement when it comes to developing internal energy. I realize I do not have to "expect" The Treasure; I feel like I can breathe freely. I can enjoy allowing the Treasure to be Uncovered. Will this attitude allow consistent progress without having to compete with myself or others? The answer has been yes, but not through "pie in the sky" but through the little things. The "little things": A student can reveal their expectations that the Tai Chi lacks quality if the classroom is not filled to the brim and in the process fail to see that the Tai Chi has made them feel better. A student can constantly complain that they lose balance when doing basic walking; "I expected Tai Chi was supposed to improve my balance" and miss the fact that they have gained strength, flexibility and body awareness. In any event, an expectation is making them unaware of what they do achieve and keeping them aware of what they "think" they should achieve. An expectation keeps them from making coherent reasoning in situations like this. Reason being, if one does not know or refuses to acknowledge where they are unbalanced, how can one expect to "improve" anything. As for me, I am happy as a teacher to work little by little toward never have any expectations and in that way, I will uncover the fact that I no longer get disappointed. Be impatient with Classical Tai Chi but don't throw out the baby with the bath water. Enter the New Year by first recognizing then taming your dragons of impatience, frustration and boredom. How do you tame them? Realize that you can't fight them but you can learn to live with them with some equanimity by simply remaining aware from whence they come. Speaking of impatience, one wonders how many students are so impatient that some will only read my email notice for 10 seconds and not the blog. Who wants to even admit they are impatient, right? 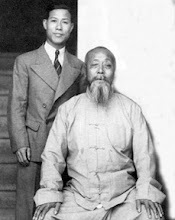 I have met many students who talk about the Tai Chi as an art that has to prove itself to them. It has to prove its efficacy and its fighting ability over other martial arts.I don't attempt to talk about the efficacy of Tai Chi over other martial arts here but I do attempt to analyze why students may feel this way. The most common scenario is a student who in various ways expresses their displeasure over the "slowness of the learning curve" whether for health or martial purposes. They express their impatience at their "slow" rate of "progress" in gaining experience or new skills in Tai Chi. Most simply leave the training early on rather than verbally expressing their displeasure. It is interesting that each student who expresses this seems to feel that they are the only student in the world who experiences this. Additionally, they state they alone are "impatient", they never mention "I guess I am not unique but I'm really like all the other students who have such impatience". If they did admit that they were not alone I think they would realize that they have literally fallen prey to boredom, impatience and frustration, which are states of mind universal to all humans and not Classical Tai Chi per se. In falling prey, they blame the Tai Chi for their impatience but in truth they are not aware of the source of those maladies. The source is something that every bored, impatient and frustrated student possesses and that is a nervous system. They figuratively throw up their hands or slap their sides and disavow the Tai Chi . In that moment how can they see what they experience as "impatience, frustration, slowness, boredom" is really proof that they need the benefits of Tai Chi even more. The more impatience over slowness of the learning curve, the more you need the benefits of the Classical Tai Chi. I wonder if they know that the true meaning of "learning curve" is really to present a graphical representation of a common sense principle. In the case of Classical Tai Chi the principle being that the more one does something, the better one gets at it. The common sense of it dictates that the more one works to curb their impatience, frustration, boredom, the better one gets at it. My own teacher Stephen Hwa addressed this common sense principle and even provides a methodology for achieving it just recently, to a student who expressed his impatience at the slowness of the learning curve when it comes to martial application. There is no mystery to be good at martial art application. This is discussed in my book and video. 1. Develop internal energy or power through Form practice, so that one can deliver the power at any angle and position. 2. Practice the form such that the ability of delivery becomes instinctive, no need to think. 3. Practice push hand and sparing to develop sensitivity and finesse. Some students visit me in Florida and express their impatience but also show me they are not close to master step 1. They are able to use internal at several moves but not all angles. From their description of your sparring experiences, (Tai Chi vs. Wing Chun, etc.) they still need to think when they move. No wonder they were always one step behind, and being controlled by the opponent. Step 3 needs a partner to practice. There is no short cut to that. I understand this a little better now in light of this analysis. Those many students also do not see that we all swim in a literal culture of impatience. The dubious virtues of multi-tasking, and hurry, hurry, hurry are extolled to say nothing of our being unaware of how much we even compete with the very machines we design to "make our lives better". When we do the Tai Chi we bring a desire for Tai Chi to get into the batter's box and knock one out of the park. What's it worth, how good is it, how fast can I get it, why can't I "get it" now? Then even though we are "swimming in a culture of impatience", it does not mean we are aware that we do so. So what we are working with is like a house with a poor foundation for living that we don't know has crumbling brick. What kind of an environment do we have here for success in Tai Chi? If the environment is shoddy to begin with, why would we add to such impatience with more impatience of our own? Then there is the inherent difficulties one faces in remembering "how to do things" in Tai Chi. What else to do but throw in the towel? I cannot help but think here of the many students who do not even make it past basic walking practice, much less get on the path to martial expertise. The common refrain I hear is when I see students wobbling and even losing their balance. The refrain goes like: "I thought Tai Chi was supposed to improve your balance". To which I say, "what it does is point out to you where you are unbalanced, the improvement is up to you". That's Classical Tai Chi, it shows you where your work is cut out for you, doing the work is up to you. Don't throw out the baby with the bath water. 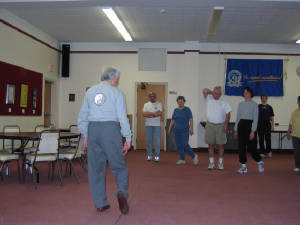 Why talk about your illness in a Tai Chi Forum? I don't want to get into why folks think that Tai Chi is a panacea, that is a big, big area, so lets not go there. It happens from time to time however that I read Tai Chi forums or any forum and see students/people revealing intimate details about their medical history...I think they feel that they are safe in doing this. I have a suspicion, it may be they feel they are safe under HIPAA and that no one can use their information in a harmful way. Overall, I think there is still quite a bit of misunderstanding about HIPAA, what it does and does not do. I can provide a definition of the acronym however: HIPAA is the Health Insurance Portability and Accountability Act of 1996, Public Law 104-191. One of the things it provides for is a privacy rule and individuals who believe the privacy rule is not being upheld can file a complaint with the Department of Health and Human Services Office for Civil Rights. According to the Wall Street Journal however, the OCR has a long backlog and ignores most complaints Wall Street Journal Examines HIPAA Loopholes . It does not mean that one's complaint will be ignored but it does sound like a bit of a "crapshoot". I will readily admit I am one of those who understand very little about it....that admission may be my best ally, I hope it is yours. I think some people believe they have a plethora of rights under HIPAA and that belief is coupled with an unawareness of how they may exercise the rights that they do have...key word here ""believe". My free advice is worth exactly what you pay for it, so I'll simply ask a couple questions: Even if this were a perfect world, which it is not, don't you agree we owe it to ourselves to protect our own health privacy? How can we disclose intimate details about our medical history in public forums on the web and expect that the information will be private and confidential? Master Stephen Hwa as a celebrant of Chinese New Year giving crisp dollar bills in a red envelope to the mouth of his Lion friend. This Chinese New Year gives us all hope for a better year in 2012 and it begins this Monday the 23rd. It is the 2nd new moon after the Winter Solstice of December 22, 2011. The Chinese year 4710 begins on Monday with the new moon, and in Master Stephen Hwa's hometown in Wuxi, Jiangsu Province it is considered the beginning of Spring. The dragon is the major symbol of good luck. In this context, we can expect great things in 2012 for since 1996 we have been through the longest unfavorable period in the 60-year cycle of Chinese astronomy. The dragon marks an end to the destructive period and the beginning of better things to come. The tradition begins before New Year's Eve by cleaning out your physical, spiritual and emotional closets. Attempt forgiveness, let go of grudges and genuinely wish peace and well-being for all. Celebrants give crisp dollar bills to friends, family and associates in red envelopes, expressing prosperity, joy and happiness. At midnight on New Year's Eve, windows are opened to bring good luck and a fresh start. Fireworks close the night to frighten away evil spirits and bad luck. 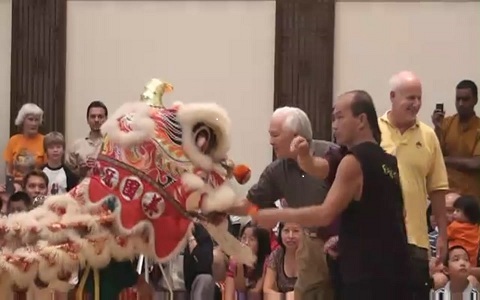 Fitting in perfectly for the ultimate goals of Classical Tai Chi, everything associated with the New Year is meant to reflect good fortune and positive affirmations, encouraging a healthy lifestyle. Greet people who bring you joy with a spontaneous smile and habitually offer them positive intentions. Implement a schedule that allows for exercise, good food, meaningful work and time for yourself. Sticking with a routine will help you make it through the winter. The Chinese New Year celebration typically ends on the full moon with a colorful dragon parade in the street. The dragon is a sign of passion and self confidence. Dragons are brave, honest and dependable. Dragons frequently help others but rarely ask for help. Many dragons prefer to be alone, and can be misinterpreted as arrogant or conceited. The Chinese New Year greeting "gung hay fat choy" is more than just a wish or desire, or a hope or belief. It presupposes that you already have the means for which congratulations are due. Do not touch your body when performing "Tight Compact Form"
I have been working more and more on the Tight Compact Round Form, not because I "want to" but because it has become a kind of physical necessity and a natural extention of the Compact Linear Round Form. I feel myself fully grown into doing tight compact form, like shedding my skin or being able to stretch further. I feel it as a natural progression and demand of the process. When I do the tight compact form, I do not have to struggle to maintain the integrity of the form; or in other words be concerned if everything is being done correctly. I can concentrate on maintaining internal discipline and not worry about doing the form wrong. Recently I asked Master Stephen Hwa about something he said in an article as well as a problem I experienced in doing tight compact form. The problem is where I still touch my own body in light of how tight the space becomes when moving arms near one's own body. On the article he wrote I said: "You said this following statement in an article that Eva wrote some time ago". He said: "For the advanced T' ai Chi practitioner, the form itself becomes less expansive externally (so-called "small circle" or "compact form"), and more angular. As such, Yi takes on increasing importance in playing the form. There is less movement and more Yi. Also, to have smaller external movements and yet reach to all angles in the form requires greater internal movement, more stretching at the Yin- Yang junctions, and more internal energy flow. This is the next level in T' ai Chi." I told Master Hwa I was intrigued by the statement "to have smaller external movements and yet reach to all angles in the form requires greater internal movement, more stretch at the yin-yang junctions and more internal energy flow". want to attack the opponent on a particular angle that compact form could not reach but tight compact could. I'm thinking largely of course where the opponent is already in contact with you and as an example, you want to palm strike to acute angle of their body with fajing ; I see tight compact being of real importance in such close quarters. With such close proximity, it would seem only such angles provide viable attack venues do they not? I said I have another question although it is by way of observation rather than conjecture: I notice when I do brush knee push during the tight compact form, I have such a hard time not touching myself because things are so tight in there. For example when compact brings brush knee hand across body then down to groin before turning over the knee, tight compact brings the brush knee hand tight into chest area and very close to the other arm, it is extremely difficult not to touch myself with it so tight? compact form, that move is different from compact form. I think I explain that in the Disc 4, that move is more circular, that is the elbow stretch more forward with the hand comeback to the body." I responded to Master Hwa with: " I have to say I looked at the Disc 4 numerous times and see that more circular move and more forward elbow stretch. However, in regard to touching oneself when doing the compact form, I have to say as being taller I have to take a little longer step size when doing compact. Also, I find I have to still take a little longer step size when doing tight compact. There is no way I can do form and maintain good balance when I try to take same size as you for instance. So I am thinking perhaps the question of touching oneself still has one's size as an exacerbating factor." I continued with: "So many different body types are doing this, I am surprised the question I raise has not come up before now. Not just with tight compact, for as far as I know I am only one doing tight compact. But I am surprised no one says, in spite of their best efforts they find themselves touching their body even during compact and more linear movements. Some people's arms are extremely long, one wonders how does one deal with this without compromising the form." He responded with the suggestion that perhaps this might indeed be a good question to ask the group of Tai Chi players in the Classical Tai Chi Yahoo Email Group. I did just that and received a couple of responses. I have some good news to report on how things have improved here, thanks to encouragement from Master Hwa, a few great students and the wonders of technology. I hope what I discovered will help everyone else as well. Originally my wrists were bent at almost a 90 degree angle which is similar as well to what another student says he experienced, in order to avoid hitting the arm. I think the expression is that the hand and wrist are "seated". Note the difference in this "seated" position of hand and wrist from other positions of hand and wrist in the form. I think hand should be seated but I do not think it is correct in this to have such an angle that the wrists lock and Qi is blocked. I also experimented with NOT having the hand pointing up, seated, and/or locked but with the hand pointed down as it passes close to the chest and other arm. In other words, I fold the wrist down much like single whip in order to try getting it past the arm and close to the chest. In both cases I still end up touching my shirt. I'm not sure if even a skin tight, as my wife calls it "tight as a doll's shirt" would keep me from touching something, it just seems too tight in there. In both I will admit however if I took it at a literal snail's pace, watching my hand and fingers I can do it without touching but this is uber slow. It is very "obvious" and hardly "formless" when one has to go to that much trouble. Then some good news: I watched Disc 4 and the Compact (Tight) Form sequence, that I provide here with Master Hwa's permission, once again in slow motion. I find in watching Master Hwa's arms and upper arm elbow, that I was bringing the elbow of the upper arm too close to my body. In a sequence of moves where every inch of space becomes important, the potential to create more space is important. See the Form sequence to see what I am referring to as he does the brush knee sequence . I now find that I have more room in which to avoid hitting the "seated" hand as it passes by and touching my body. I don't have to "lock" the wrist. In order to see this as I describe it, I used the KMPlayer and put the video at 50% of speed to view things in slo mo. I see that the elbow of his upper arm is actually at a significant distance from his chest on the side. A rough estimate of distance, no pun intended would be one hands length if you touch your heel of palm your own chest side and extend the fingers, the angle and distance is more than I could observe when the DVD was in regular speed. I find now that I can do the move without watching my hand and am able to speed it up a little more without touching myself. I look forward to more practice with the arm and elbow at that increased angle and distance from the chest. The elbow is still pointed down on the upper arm and as the palm strike proceeds forward, I can then bring the elbow in toward my center of body in a circular fashion instead of linear as in the Compact. Well, one thing about tight compact form is that I did feel it as a "natural progression" (p. 74 Uncovering the Treasure , Stephen C.P. Hwa, or as I call the book : "UTT". My jury is still out on how "easy" it is because I have to work for consistency in keeping that elbow the same distance from the chest. To other people who do Classical Tai Chi particularly if you are a tall person; we have this commonality of long limbs, legs, arms, torso, hands as well when we talk about it. My next conundrum is being able to shrink my step size and still stay balanced. 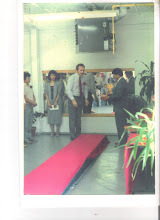 When I started Linear Compact Form Master Hwa urged me to slightly increase my step size because of my tallness, I was losing some balance. Like I said, Tight Compact has a smaller step size p. 74 and a larger step size would create slowness and obviousness...however what we are after is instantaneousness and effortlessness. Then, "From Form to Formlessness". Thanks for the encouragement one and all.